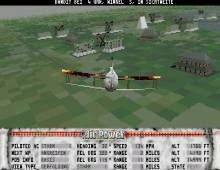 ”With the somewhat awkward and entertaining flight sims, Dawn Patrol and Navy Strike, under their belts, British-based Rowan Software has teamed up with Mindscape to produce Air Power: Battle in the Skies, a fantasy air-combat simulation. The ideas behind their previous games have been good ones, bringing new levels of depth and entertainment to the often unimaginative world of flight sims, and Air Power is definitely their best yet. But as anyone who’s played Dawn Patrol can tell you, there’s always a little something about these titles that just doesn’t feel quite right. Mushy flight models, screwy keyboard layouts and finicky joystick support have been at the heart of the problem, and they’re enough to keep Rowan’s flight sims from being as successful as they could be. While Air Power still suffers from many of these same problems, it does have one of the best premises I’ve encountered in a sim. Its alternate-history plot begins with an impressive full-screen video sequence detailing the history of lighter-than-air craft in warfare, pointing out that until the Hindenburg crash, Germany had ambitious plans for the use of dirigibles in warfare. Air Power runs with this idea and suggests a landlocked country, Karanthia, where four nobles fight for a vacant throne using fleets of airships. These airships are large, floating aircraft carriers, launching fighters and bombers from their bellies and retrieving them on hooks. The goal of the game is to build support by moving your fleet among different kingdoms, using your diplomat to negotiate where possible, and coordinating air strikes where necessary. You can win by gaining allies, or force your way into the capital, or try and defeat the fleets of the other three dukes. Negotiating for allies and choosing where and when to strike adds a lot to Air Power, but the real purpose of this game is flying combat missions. The planes are all hypothetical prop-driven planes based loosely on World War Two aircraft, and come equipped with guns, rockets, or free-fall bombs. Although there’s a good variety of aircraft, they all handle pretty much the same way, with slight variations in speed and maneuverability. This wouldn’t be much of a problem if it weren’t for the fact that the controls are over-responsive and the flight dynamics far too forgiving. For the casual gamer, this may feel just fine -- but for a sim fanatic, it just doesn’t feel comfortable. That’s a shame, because missions like fighter sweeps, ground attacks, and swirling battles around armed blimps are such a delight. The SVGA graphics are simply beautiful and run quite smoothly despite the high resolution. Rowan has also improved on their sound effects, with good gun sounds and wingman chatter. Unfortunately, they left in the bewildering, inexplicable keyboard commands from their previous games, with well over thirty keys for views alone, all of them mystifying and awkward. Aside from these few points, Air Power is a real delight as a general flight sim and distinguishes itself with a good story and strategy angle. 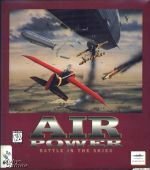 Hard-core sim fans will be frustrated by the awkward controls and elaborate keyboard commands, but gamers interested in some genuinely engaging action will find it in Air Power.” Two thumbs up, way up!